Bancroft, ON., November 29, 2015 – Sylvain and son Simon Vincent of Terrebonne, QC., won the Rally of the Tall Pines, the final round of the Canadian Rally Championship. After a long career in the sport and numerous podium finishes, Sylvain had earned the rank of Grand Master though a national victory had eluded the driver for his entire career. The team drove a consistent pace, and took over the lead early in the rally after running in second place through the morning stages. “It happened so many times that we were close, finishing second, but I never had a victory,” said Vincent, who decided to retire from the sport after this event. “I’ve always said that this rally is the toughest rally. For me, it is very physically demanding, but I really like the roads, so it balances out. But after a rally like this, you’re exhausted. Brandon Semenuk (Squamish, BC) excelled on the technical forest roads in his first ever Rally of the Tall Pines. Teamed with co-driver John Hall (Sherwood Park, AB), Semenuk had never rallied in eastern Canada, and had yet to finish on a national podium. Another newcomer to the national podium was the pairing of Jeremy Norris (Kitchener, ON) and Jeff Hagan (Leamington, ON). 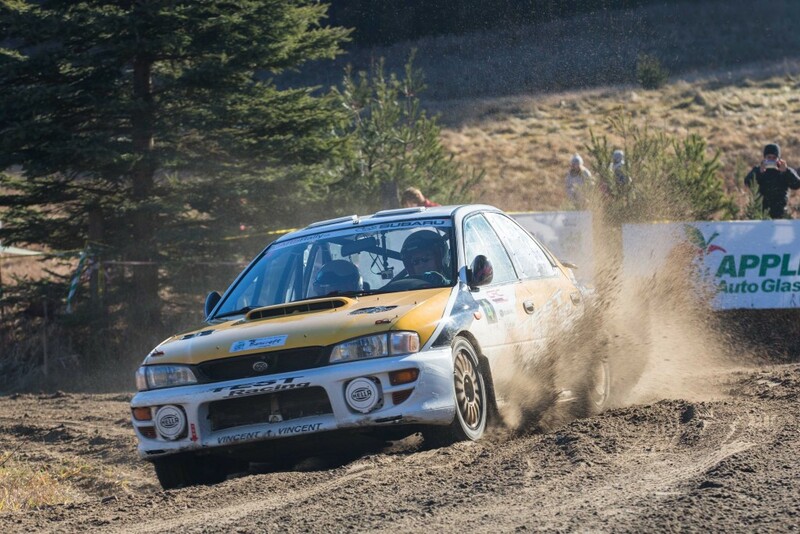 Norris made his rally debut at Tall Pines five years ago, and overcame problems this year to finish third overall. A lack of turbo boost at mid day forced the team to take time penalties while making repairs. Once back on the road, they pushed incredibly hard to make up time and positions in the standings. Simon Dubé (Jonquiere, QC) closed out his season with a victory in the two wheel drive class, with the help of co-driver Eric Lachance (St-Bruno-Lac-St-Jean, QC). Dubé has had mixed fortunes in the past at this rally, but had only minor problems this year. A flat tire on one stage forced the team to slow their pace, losing just a few seconds from an otherwise near-flawless performance. The Rally of the Tall Pines marks the end of the 2015 Canadian Rally Championship calendar. Snaking along forestry roads in the heart of the Canadian Shield, the 2015 edition demanded the utmost from every team on the start list. Rain on the day before the event soaked the roads which in turn became a mix of gravel and ice when overnight temperatures dropped well below freezing before the start of the rally. While grip was mostly good on the sandpaper-like roads, some locations were slick with mud. In these unpredictable conditions, some teams were caught out, ending their rally early. The rally route totalled nearly 200 kilometres of competitive stages.